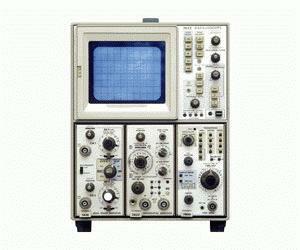 The Tektronix 7633 Storage Oscilloscope is Üa multi-mode storage mainframe which uses a wide variety of plug-ins including logic analyzers, spectrum analyzers, sampling scopes, and of course, oscilloscopes. This three compartment mainframe has a stored writing rate of 1000 cm/µs with display modes of Store, Nonstore, and Save. Store modes include bi-stable, variable persistence, fast bi-stable, and fast variable persistence.